Many thanks to Gary and Virginia Faust for getting these entries from the TMH website uploaded to OpenDurham. See the original research at www.trianglemodernisthouses.com/durham.htm. 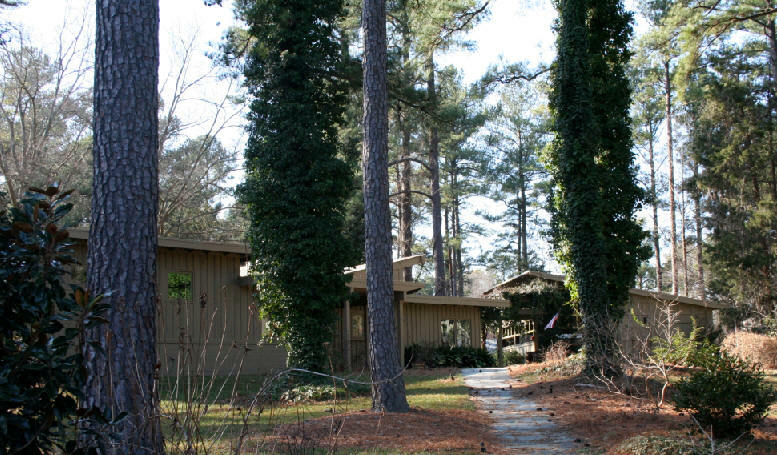 Built on land that was originally part of the property of 1311 North Mangum Street, directly to the north, the International Style house at 1307 North Mangum Street was built by Mr. and Mrs. Howard Gamble in 1935. Mrs. Gamble's father, Richard E. Dillard, who owned 1311 North Mangum, subdivided his property and gave the southern portion to his daughter and son-in-law to build their house. 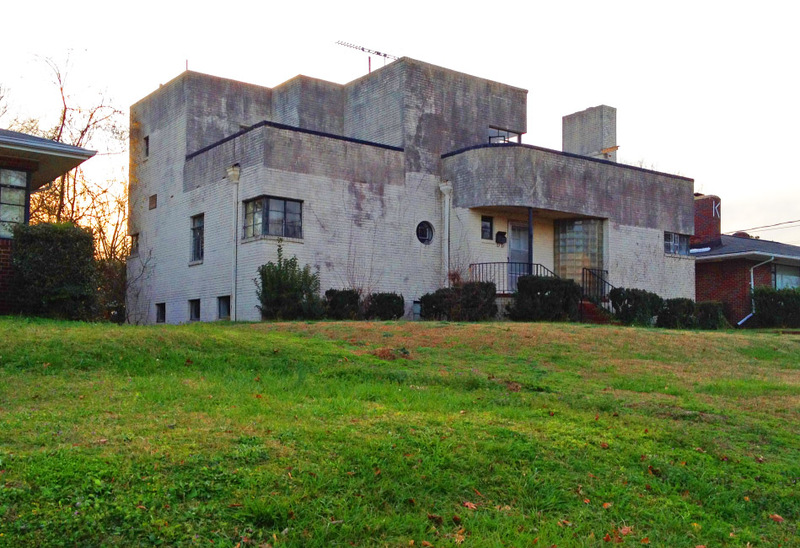 The Gambles who "took an active interest in modern art, architecture, and photography" worked with Asheville architectural firm Greene and Rogers to design the house. 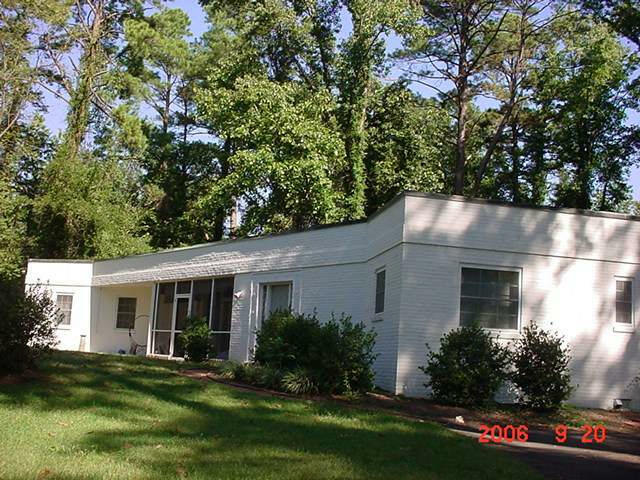 The house was an early example of an International Style house in the country, and particularly unique for being located in Durham - in North Carolina - in the South. A celebrated novelty in Durham when built, the house integrates technology and aesthetics that combine metal, glass, and poured concrete in a design for a new open spatial vision boldly expressing the principles of the Bauhaus, the leading German school of design in the 1920s and 1930s. ... 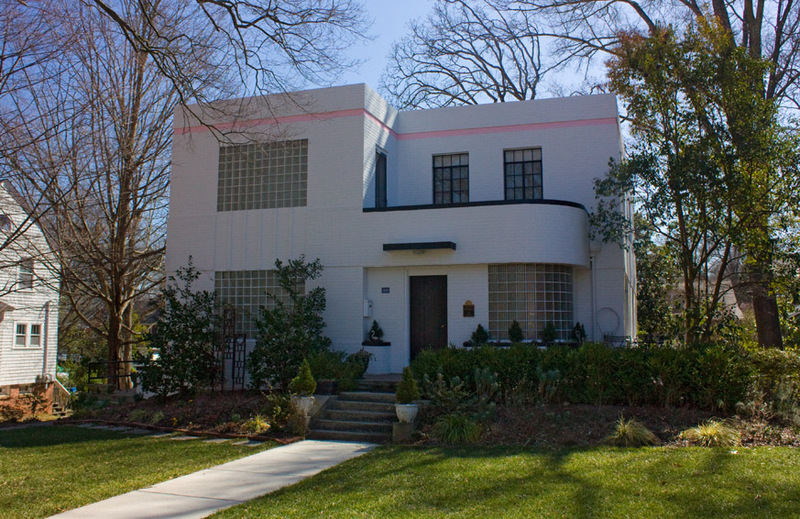 The flat, unadorned walls, which form the box-like sections of the house that truthfully reflect the floor plan, and bands of windows that often make a 90-degree turn at corners, are hallmarks of a style that was just beginning to appear in the United States in the 1930s but was never widely accepted, least so in the Southeast, for domestic architecture. Emphasis throughout is on the horizontal. 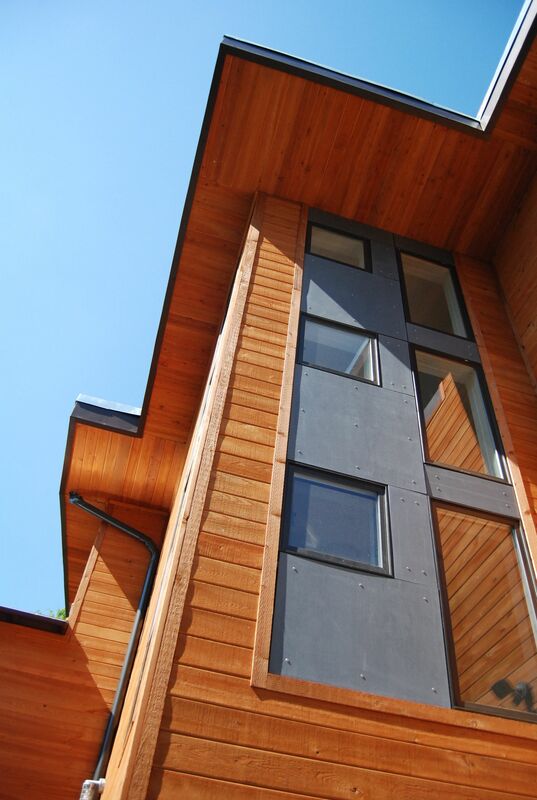 Undecorated surfaces of exterior walls and windows longer than they are tall enhance the effect of expansion along the ground. The many windows plus the frequent access to terraces on both levels increase the impression of large open spaces as the separation between indoors and outdoors is diminished. The floor plan is also unusual for its time as the communal living areas are at the rear of the house and the kitchen is at the front. A curved staircase, indirect lighting, fireplace surround of mirrors and black Belgian marble, and vivid color schemes highlight the interior. 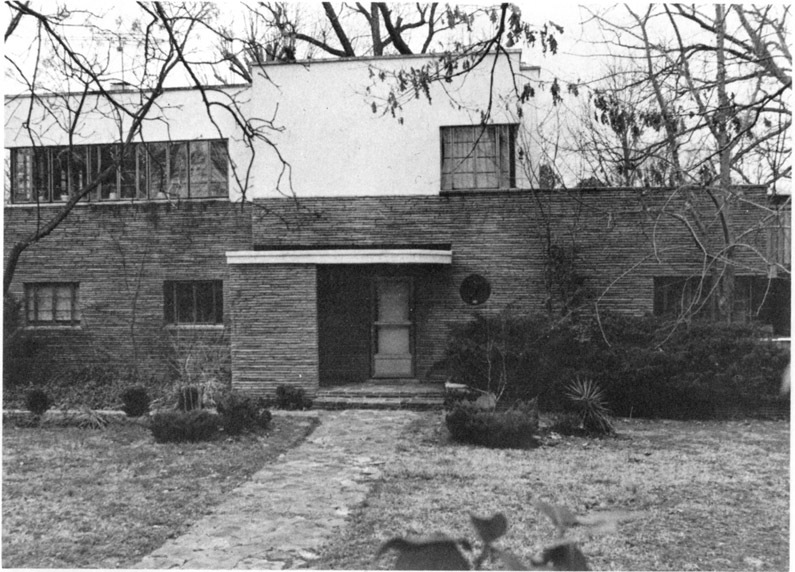 In the decade after its construction, the house was featured in national magazines, and for many years was included in the Durham Chamber of Commerce's brochure "Points of Interest in Durham, North Carolina"
In the 1950s, the house had an unfortunate treatment with Permastone on its exterior, and slid into disrepair after conversion to a rental property. Gamble house with a sheathing of Permastone, late 1970s. 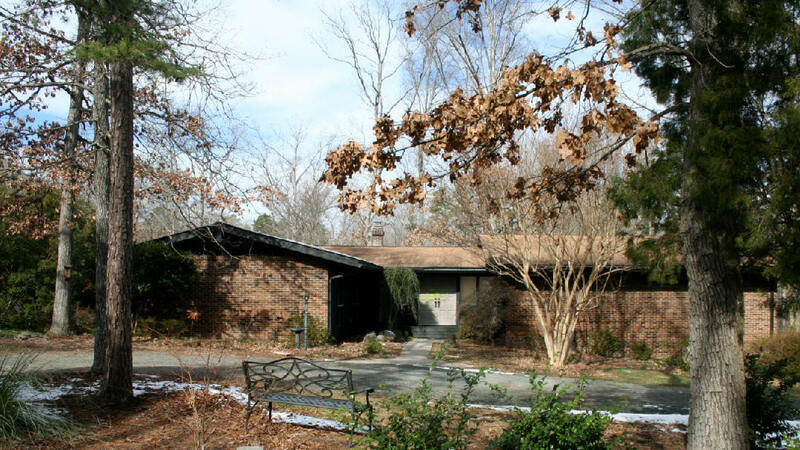 In the late 1970s, the house was purchased by Gerard Tempest (who remodeled Fire Station #1 as an office building in the 1970s and would build "The Villa" in Chapel Hill out of parts of demolished Durham mansions.) 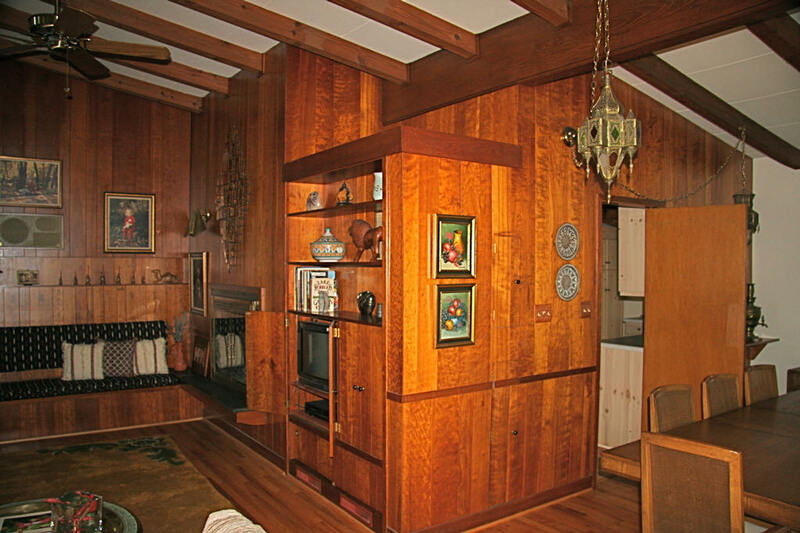 Tempest refurbished the house in the late 1970s, adding it to the National Register in 1978. The house remains in the Tempest family; it remains impressive on the interior, and enjoys a beautifully bucolic vista from the backyard, aided by the property's 0.66 acres and the fact that the middle of the block at the rear of the property trails back into lowlands and a powerline easement. 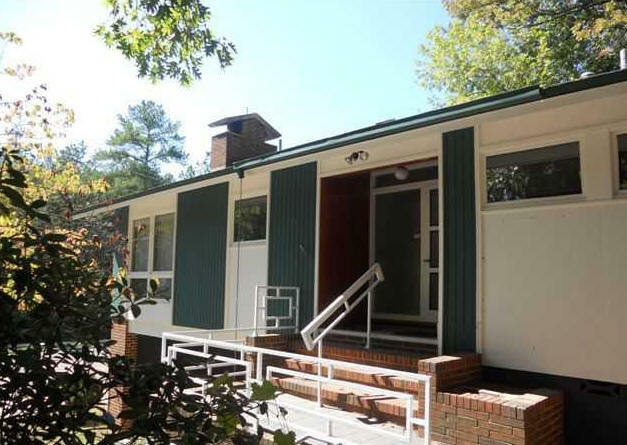 The Evans house was built in 1937 by Eli Evans and his wife Sara; Evans had come to Chapel Hill to attend UNC from Fayetteville, and Sara had come to Durham with her parents, the Nachamsons, who started United Dollar Stores on West Main Street. Eli and Sara were married in 1928 and took over the United Dollar Stores - which would become Evans' United Department Store - in 1929. 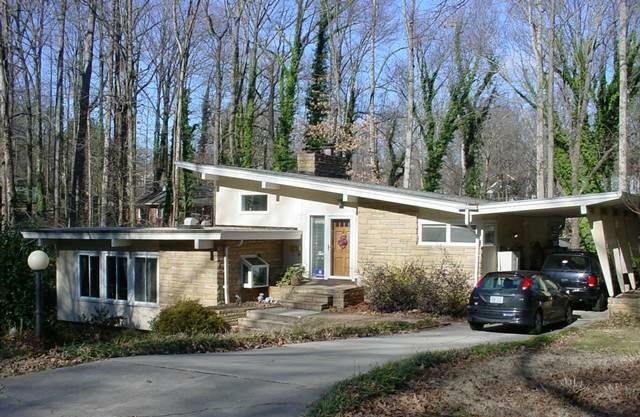 I'm unsure where they lived prior to commissioning this house, but they hired Durham architects Atwood and Weeks to design the house in a very-unique-for-Durham International Style in 1938. Per the Historic Inventory, "the builder of the house tested the design by constructing clay models to be sure that the curved wall of glass brick would be structurally sound." 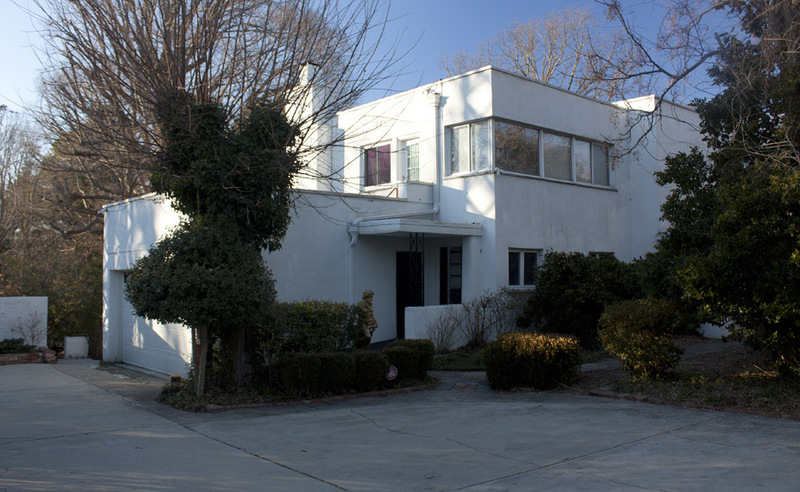 The house was built as a duplex, and the Evans rented out the second floor apartment. 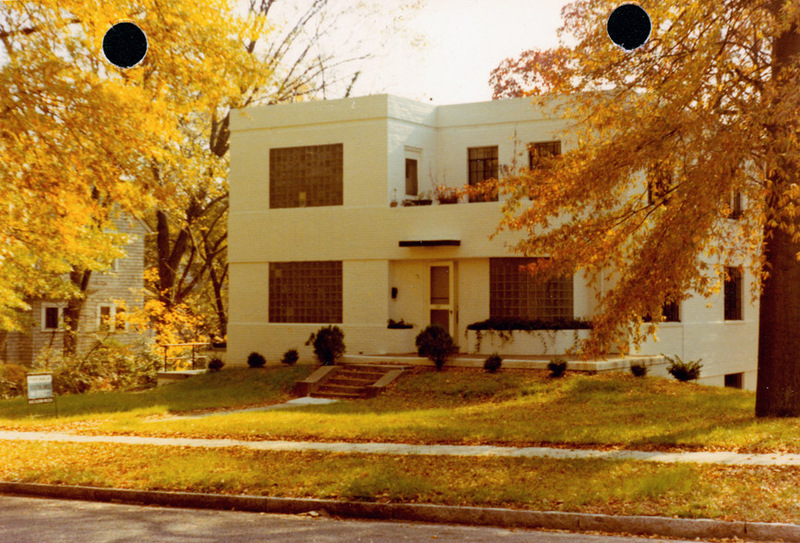 They lived in the house until 1950, when they moved to another modernist house at 1401 Forestview in Forest Hills. Evans would serve Durham as its mayor from 1951-1963. The house later became a sorority house, per the historic inventory, with the large basement "used as a game room." It was subsequently further divided into apartments. In 1994, the then-owners received a Pyne award from Preservation Durham for restoration of the house. 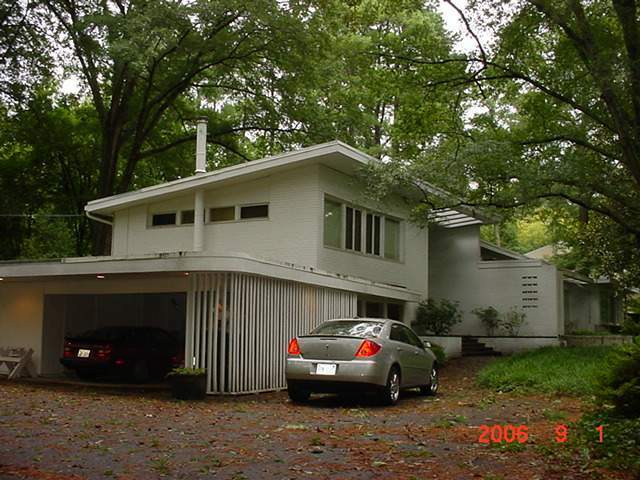 The rambling modern split-level house, with Roman brick walls, originally occupied the entire block between Wells and Bivins streets. On the rear, the house wraps around two sides of an original swimming pool, with an adjacent round, flat-roofed pool house and large terrace. The Evanses entertained here frequently in the pool and courtyard space. Their house was often called the “Jewish Country Club” as the Jewish Evanses were not allowed in other Country Clubs at the time. The house is now owned by William and Garrie Kingsbury. House Photo by George Smart. Family Photo from 1957: Sara, sons Eli and Bob, and father Eli. Designed, built and lived in by Robinson and his family. 1954 - The Russell Robinson House, 115 Ashworth Drive, Durham. Robinson was the original owner, designer, and builder. He was from Virginia and built three homes; two different homes for himself, and one for his son. Sold to Flora and Marvin Carter. 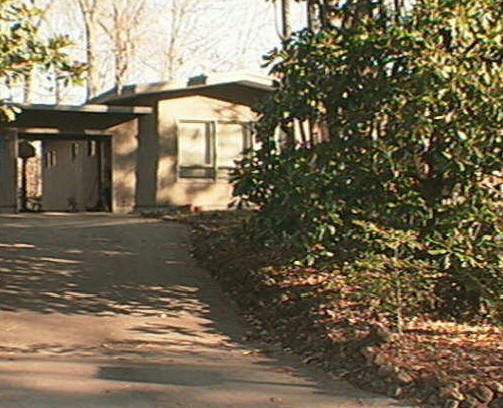 Sold in 1996 to their grandson, Rick Carver and his wife Tracey. 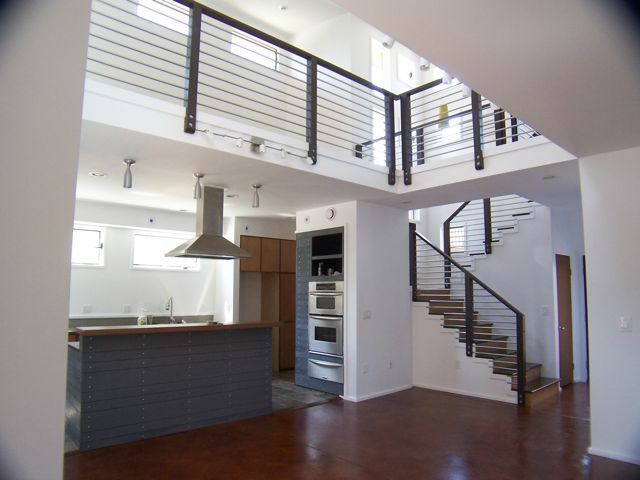 The house has 4 bedrooms, 2 1/2 baths, with 3200 sf. 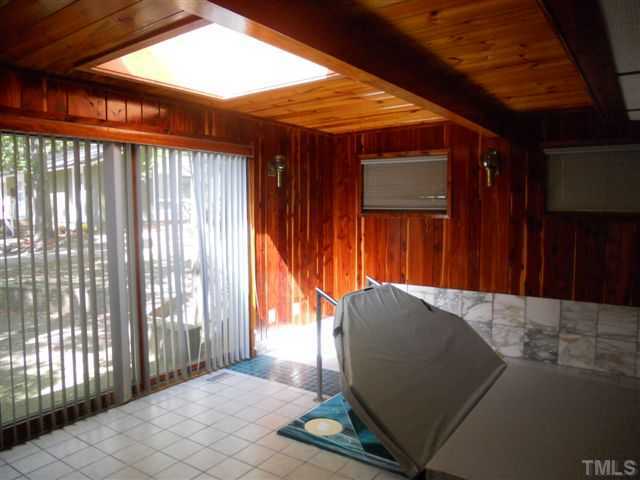 Includes pool, hot tub, atrium, and additional rec room/workshop with 856 sf. Sold in 2010 to current owners Ken and Stephanie Rowe. 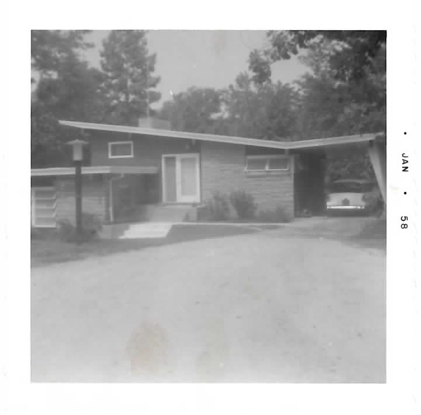 1954 - The John Bernard Pfeiffer, Jr. Residence, 3414 Rugby Road, Durham. 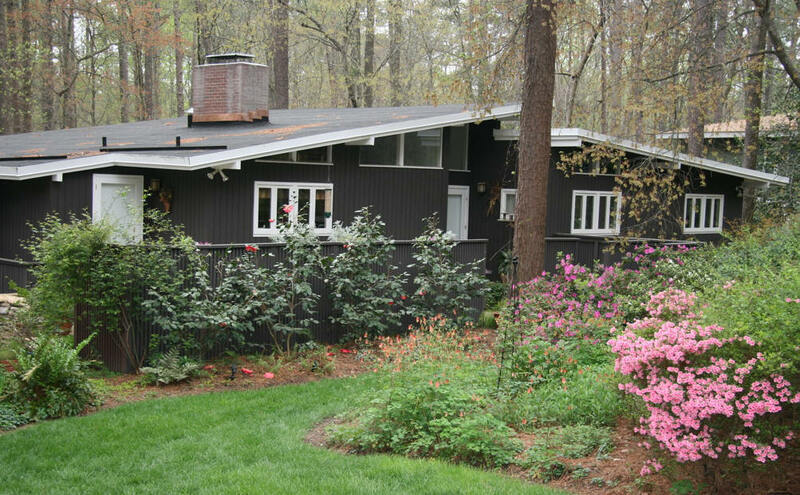 The son of architect John B. Pfeiffer of New York City, Pfeiffer originally asked his brother Richard in New York to design a new house in the Hope Valley area of Durham. But John's wife Mary Louise had a different plan. She recruited one of her local architect golfing buddies to do the plans, an act which caused a rift between brothers that never completely healed. Her architect is unknown. 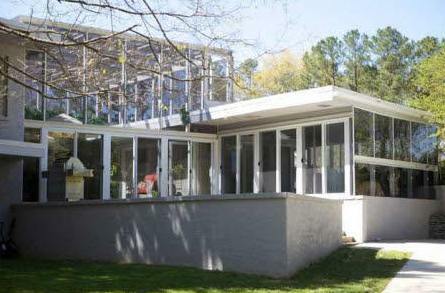 Renovated in 1959 by Pfeiffer's father's firm. 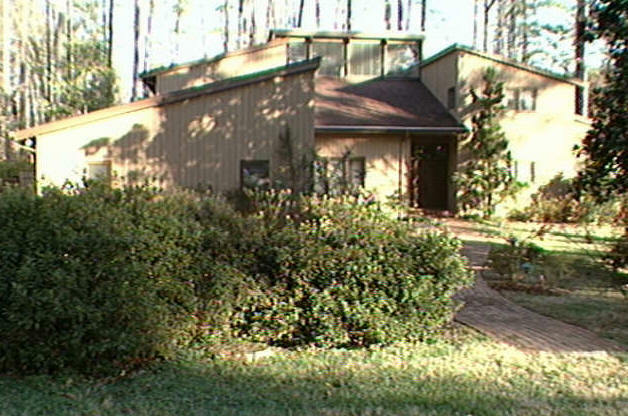 Sold in 1988 to current owners Raymond and Cynthia Joyner. Photos by George Smart. Designed by the original owner. The Jeanne Smith Whitesides Residence, 1506 Kent, Durham. Jeanne Whitesides designed the house. Cathedral ceiling in the kitchen. Vaulted living room with Terrazzo floors, Jack and Jill bathrooms, and a secret closet behind the mirror at the end of the hall. Sold to Allan P. and Lenore Sindler in 1959. Sold to Sheldon and Evelyn Abelkop in 1967. Sold to Mark and Nancy D. Handler in 1980. Sold to E. Ruth Teague Lang in 1983. Sold to Charles and Genevieve Cotter in 1985. Sold in 1987 to Richard J. and Suzanne H. Wrazen. Sold to 1991 Thomas D. and Nancy H. Brown. Sold in 1995 to Jonathan Goldberg and Michael Moon. 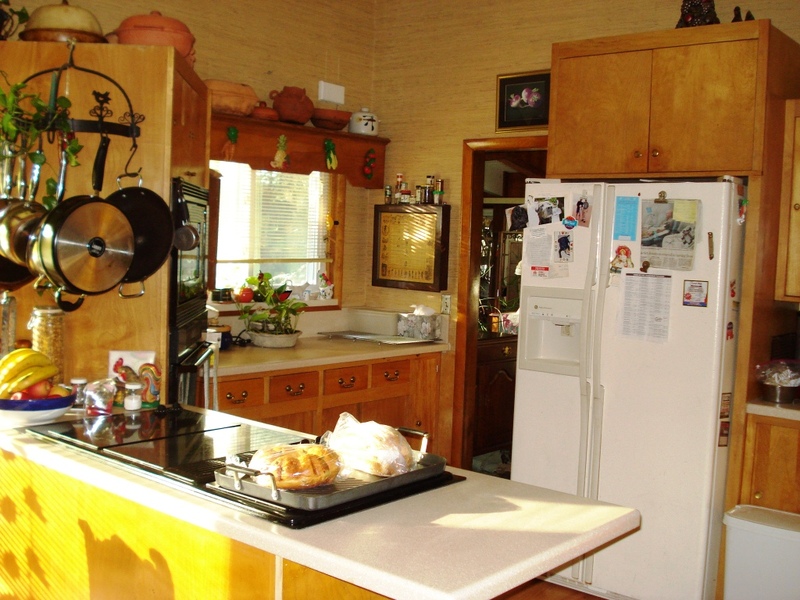 Sold in 1998 to John Burness and Anne D. Williams. Sold in 2000 to Anne D. Williams. Ruth Shaw Residence- 1210 Anderson St.
1956 - The Ruth Shaw Residence, 1210 Anderson Street, Durham. Architect unknown. 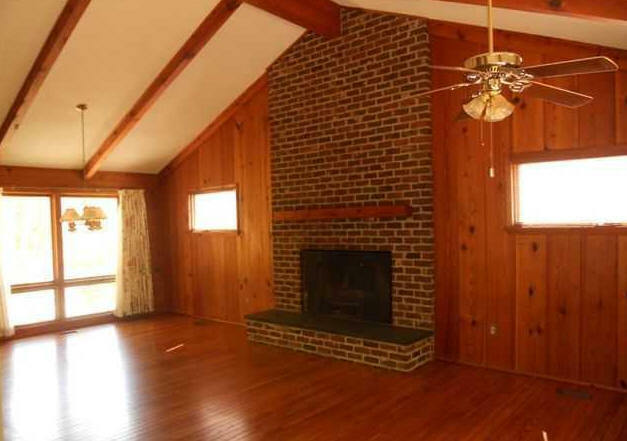 1566 square feet, three bedrooms. Shaw did not recall the architect. Sold in 2008 to current owner Christel Greiner. Twin to the house at 1210 Anderson. Sold in 1961 to James and Frances Barwick. 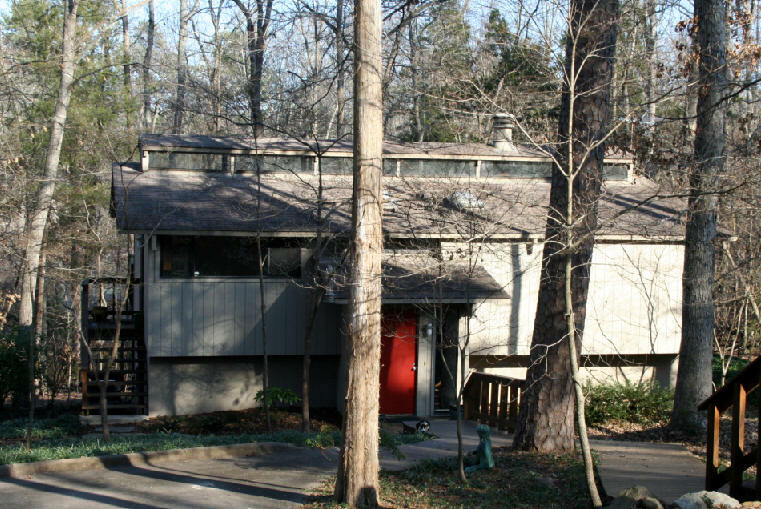 Sold in 1979 to James and Mary Kelley. Sold in 1986 to John and Irene Need. Sold in 2003 to Robert Letourneau and Russell E. Burns. The Alfred Henderson King House, 1617 Shawnee, Durham. Designed and built by T. W. Wilkinson in 1957. Essentially a multi-level ranch house in structure and style, the King House is four separate levels with a central stair, alternating back and forth between public and private areas. Sold to Nixon advisor Nicholas H. Morley, who used it while in town for the Durham Rice Diet. 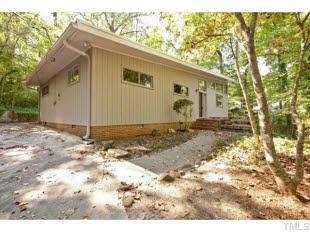 Sold to Walker L. and Martha Pruitt. Sold to 1978 to Jack and Judith M. Keene. Sold in 1987 to Michael and Rosalind Harris. Sold in 1990 to Victoria Mask. 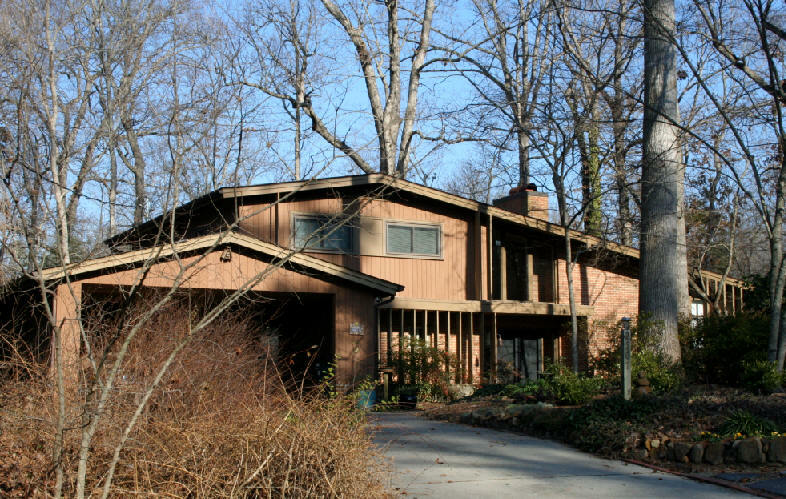 Undeveloped until the middle of the twentieth century, the southeastern portion of the Duke Park neighborhood around Hollywood, Anita, and Shawnee Streets is notable for a cluster of modernist houses built in the 1950s and 1960s. Much of this area was owned by developer and builder T. W. Wilkinson, who at the time lived in the neighborhood in a home he built for himself and his family at 406 East Markham Avenue (see entry on this house, also on the tour). Wilkinson either sold the lots to clients and worked with them to build custom houses, or in some cases, designed and built individual homes before selling them. One of the most striking of Wilkinson’s custom homes in this vicinity is the house at 1617 Shawnee Street. 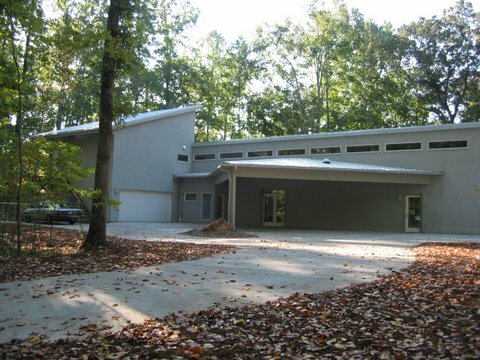 Built in 1957 for the Alfred H. King family, the modernist structure of redwood and Tennessee Crab Orchard stone consists of four alternating levels and a carport under a butterfly and flat roofs, situated on a sloping landscape and surrounded on two sides by native conifers and deciduous trees. 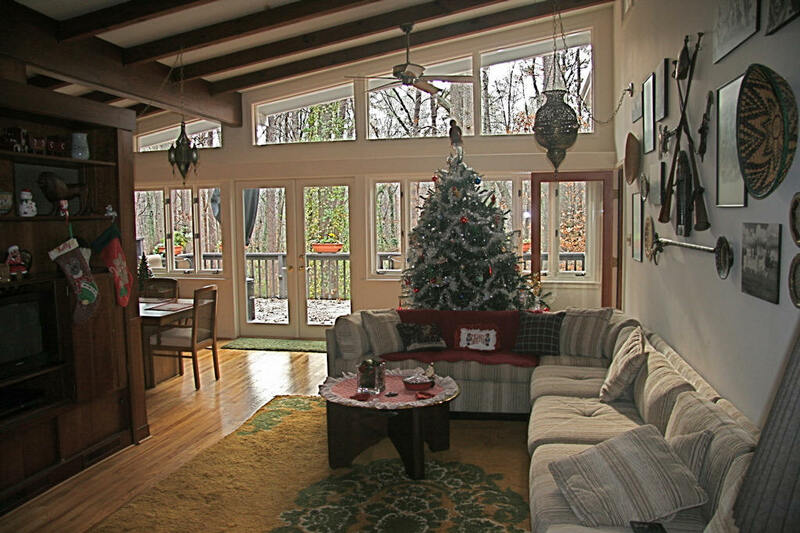 The walls of the house are filled with a multitude of awning and picture windows, allowing a direct interplay between the dwelling and the natural world. 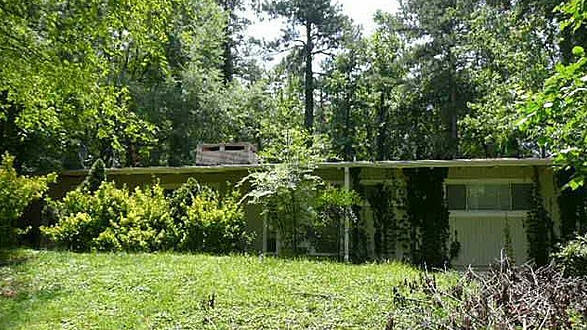 This house was completely up-to-date for 1957 and looks as if it could have been featured in a Better Homes & Gardens issue of the day. 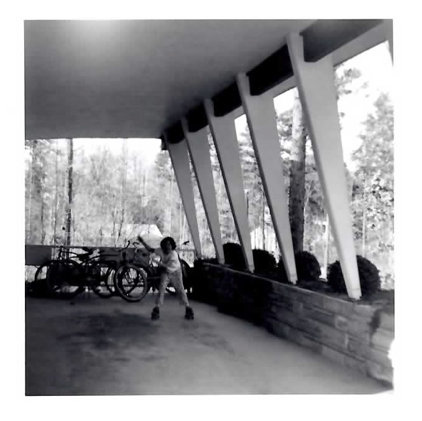 Young families in the 1950s found themselves looking for homes that offered ease and convenience in an interior plan; little decorative detail; and an indoor-outdoor unity that offered a relationship with nature. Unlike their Victorian ancestors, they cared little for decorative details but rather wanted houses that reflected the youthful vitality of postwar America. California and West Coast living set the trends, and 1950s’ consumers nationwide clamored for the sunny frivolity embodied in the California contemporary style. 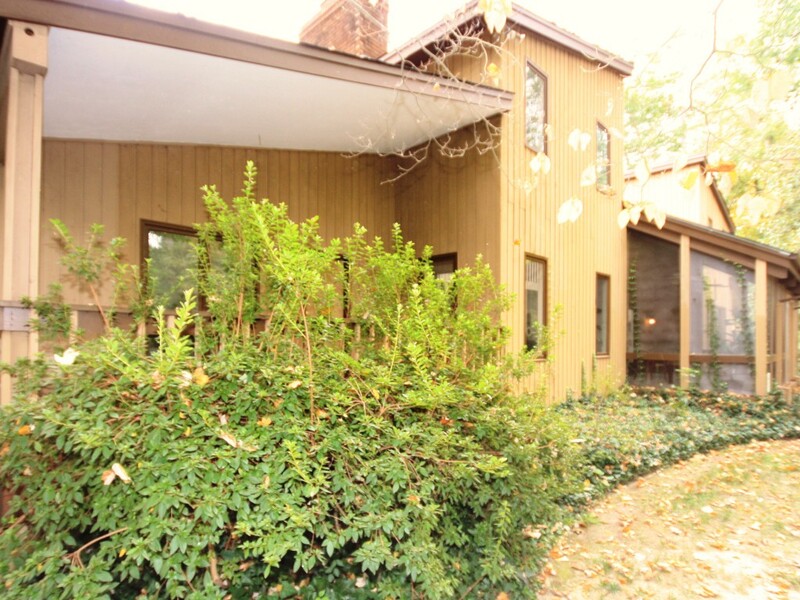 Alfred H. King and his family were already Duke Park residents and had known Wilkinson as a neighbor and friend when they purchased the Shawnee Street lots from him in 1956 and 1957 and commissioned him to build their new home. Rarely working with an architect, Wilkinson read widely and was a passionate and experimental self-taught student and practitioner of the built environment. He was a great admirer of Frank Lloyd Wright, who championed an organic architecture in which the building and its surroundings blended in perfect harmony. Alfred Henderson King (1920-1992) was born and raised on North Driver Street in East Durham, the son of J. Robert and Luna B. King. Al’s father operated Crabtree Pharmacy at the corner of South Driver and Angier, and after graduating from UNC-Chapel Hill in 1942 with his pharmacy degree and then serving in the U.S. Navy, Al King returned to Durham to work with his father at the pharmacy. He met Jane Barbee (1923-1997) while she was still a student at Durham High School. Jane was the daughter of Harvey Clyde Barbee and Lula Gray Baker Barbee and was also a Durham native, growing up on Buchanan Boulevard overlooking Duke University’s East Campus. The couple was married in Durham in 1942 and began their family after King returned from the war. 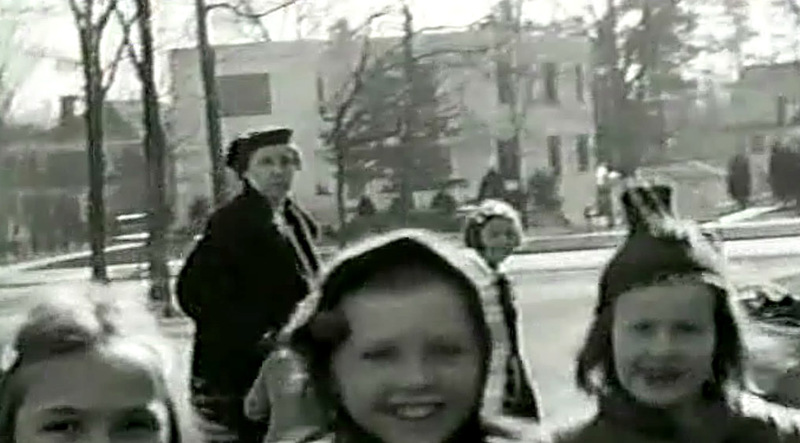 Their three children were born in Durham in 1947, 1948, and 1952. The family resided for several years on East Markham Avenue before commissioning the Shawnee Street house. 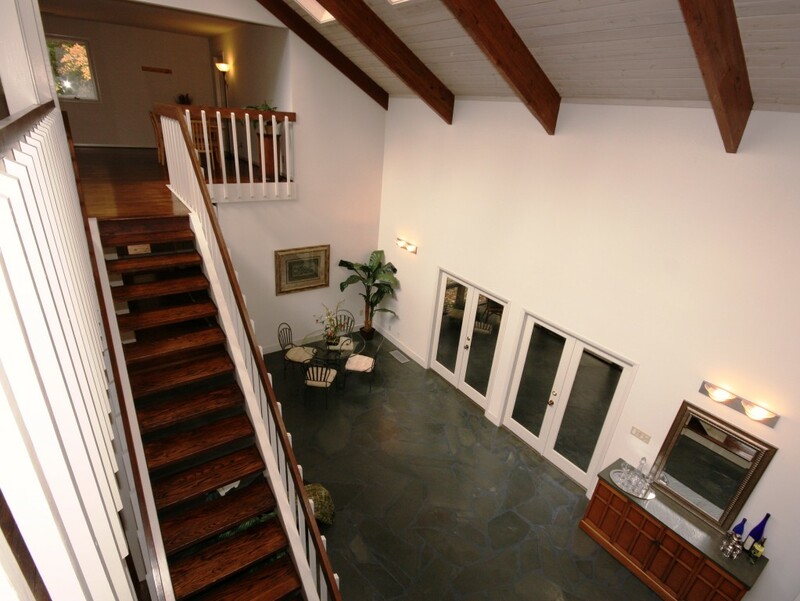 Essentially a multi-level ranch house in structure and style, the King House is four separate levels with a central stair, alternating back and forth between public and private areas. One enters the house on the upper level through a solid door with a large single-pane sidelight, where beyond the entry foyer are located three bedrooms (one for each of the King children) and a bath. The main living area is found down the first flight of stairs. 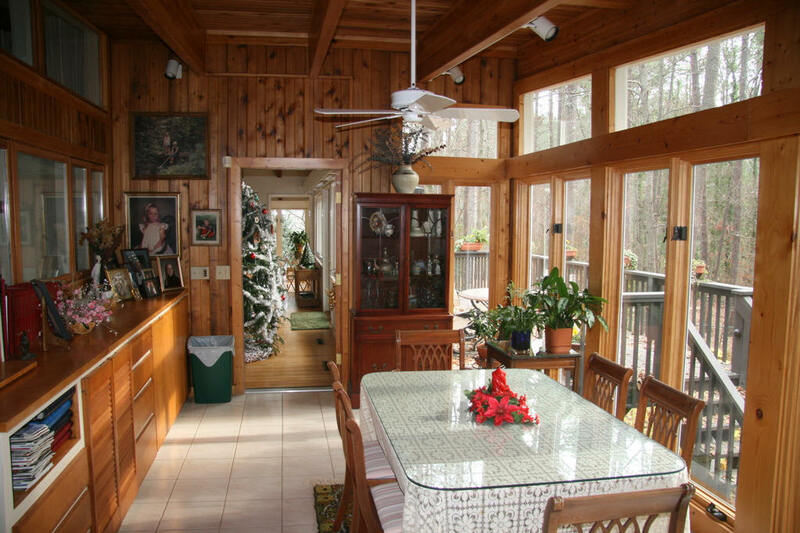 A small kitchen is contained in a room on the left (originally decorated with bright yellow and black wallpaper and pine cabinets), while the rest of the floor is a expansive open dining and living space filled with large windows overlooking the wooded landscape. Another dominant feature of the space is the Crab Orchard stone fireplace found along the interior wall, with its wide chimney rising up and out through the center of the house. The next floor down contains the master bedroom and bath, opening onto a porch and deck, as well as storage and laundry areas. And finally, the lower floor was the one most important to the King family. Essentially a multipurpose recreational space, this large, cool room connected directly to the outdoors. This room had a parquet dance floor and a comfortable bar and was decorated with a hand-painted seascape on the wall. The Kings had Witherspoon Rose Culture landscape the grounds, and dozens of large azaleas were planted beneath the tall trees. A slate patio was short walk across the wooden bridge. After his father’s death in 1969, Al King continued to own and operate the Crabtree Pharmacy. He had no intentions of selling his house, but one day in the spring of 1973, while he was doing some painting in the kitchen, a man walked up to the house and rang the bell. The man asked Mr. King if he wanted to sell his house. He replied that he had no intentions of selling the house. According to King’s son, the man then offered King much more money than the house was worth, and King sold the house on the spot. The man mentioned that he owned 8 or 10 houses all over the world, and he gave the condition that the Kings must be out of the house within 30 days. He needed it right away. The Kings sold many of their possessions in a yard sale on a subsequent weekend and moved to a trailer on some property they owned in Hillsborough. The deed shows that the house was sold to “Morley Realty Corporation, a Florida Corporation.” Neighbors who moved next door in 1974 said the house was owned during this period by Charles “Bebe” Rebozo, President Richard M. Nixon’s friend and real estate investment advisor. “Everyone in the neighborhood knew that Bebe Rebozo was using the house,” they said. “After he left, we found 21 phones in that house.” Records indicate that Morley Realty Corporation was formed in Florida in 1963 with Nicholas H. Morley as their registered agent. There was certainly a connection between Morley, Rebozo (also a Florida real estate developer), and Nixon (The Washington Post reported that Morley traveled to South America along with Pat Nixon in March 1974. ), though there seems to be a simple explanation to the story, rather than a mystery. 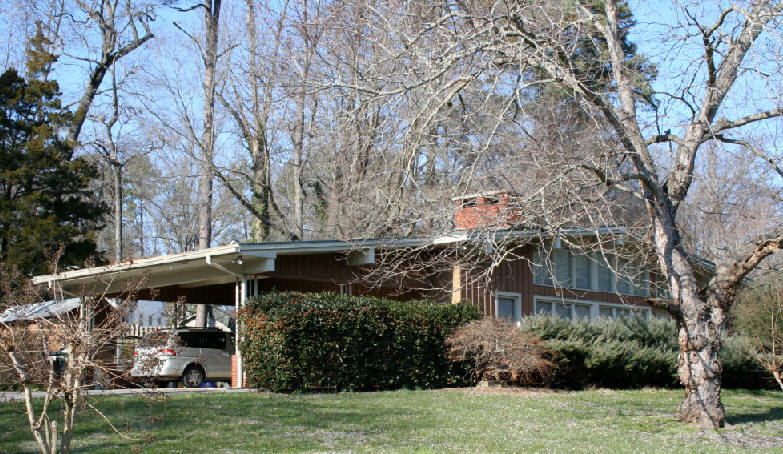 Morley Realty Corporation sold the house in 1977, and the next owner, Walker Pruitt, said that Morley bought it simply to live in while in Durham on the Rice Diet program. Since 1977, the house has had three other owners before being purchased by the current owner in 1990. It has been a home she has loved for over 20 years. She has made a few tasteful alterations to the house, enlarging the bathrooms and adding a window to the bathroom on the upper floor to bring a greater openness into the entryway. 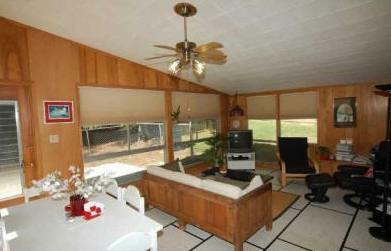 She added a deck off the main living area so that she could more easily go outside from that space to enjoy the garden. Her lovely artwork and the antiques and special pieces of furniture she has give the home a happy warmth. 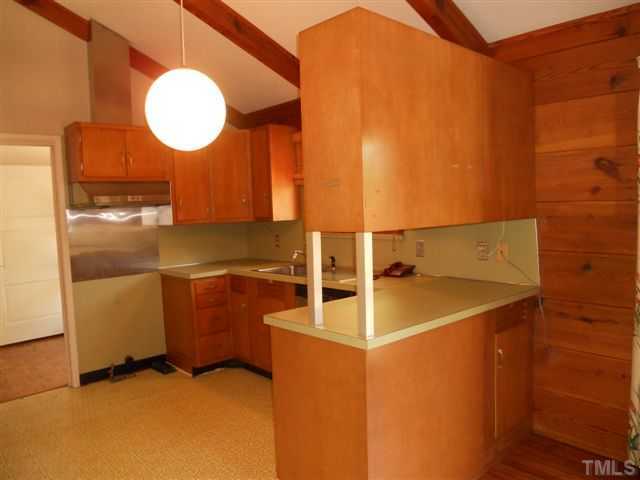 This mid-century modern home continues to be as comfortable and attractive today as it was fifty years ago. According to their son, the Kimbles designed this house themselves, Built by James (Jimmy) Heizer of Heizer Construction.When the Kimbles moved to Colorado in 1968, they sold the house to Stanley Appel. Bought by current owners Bryan and Vicki Koon in 1977. According to their son, the Kimbles designed this house themselves. Built by James (Jimmy) Heizer of Heizer Construction. When the Kimbles moved to Colorado in 1968, they sold the house to Stanley Appel. Bought by current owners Bryan and Vicki Koon in 1977. 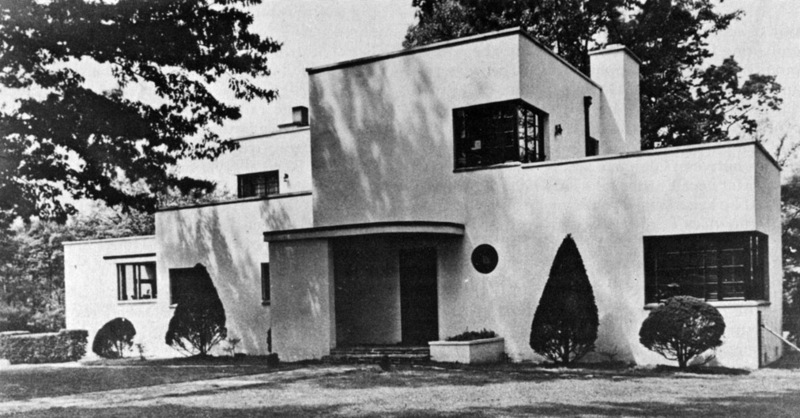 This is Plan X-50 by architect Rudolph A. Matern of Jamaica NY. When Mrs. Bradley died, Mr. Bradley moved out and later remarried. Was vacant for an extended time. Sold in 1985 to John and Sheryl A. Lubans. Renovation and addition in 1989. The Stewart and Jane Alexander house was built by Jane Alexander's brother from Tennessee. This ranch brick house has a 2-story center block, slab floor, a flat roof, a recessed entrance, and a 1-story left side wing. In 2000, the house was sold to and renovated by Douglas "Casey" Herbert and Kathleen Bennett. 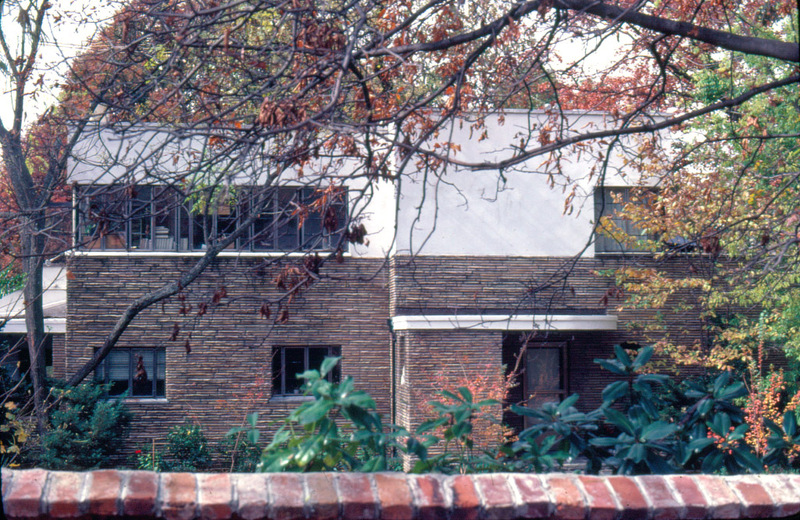 The original architect is unknown, but Carrboro architect Giles Blunden designed replacement casement windows and a latticework brick wall that screens the original carport at the left side. The Stewart and Jane Alexander Jr. Residence. This ranch brick house has a 2-story center block, slab floor, a flat roof, a recessed entrance, and a 1-story left side wing. In 2000 the house was sold to and renovated by Douglas "Casey" Herbert and Kathleen Bennett. 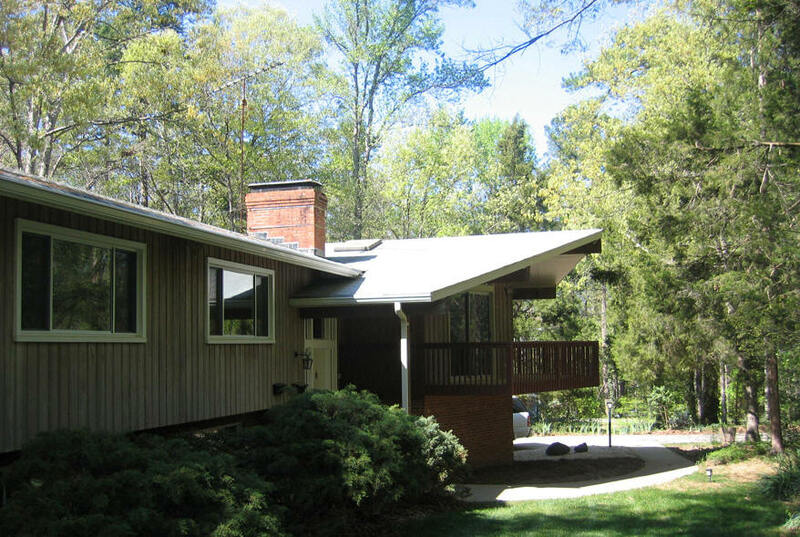 Carrboro architect Giles Blunden designed replacement casement windows and a latticework brick wall that screens the original carport at the left side. 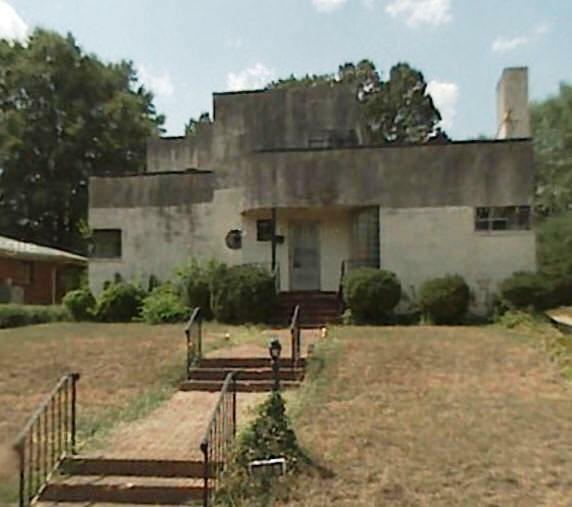 This house is a definitive example of post-World War II modernism. 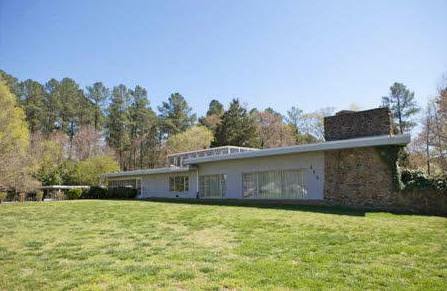 It was built in 1958 for Stewart and Jane Cowan Alexander. 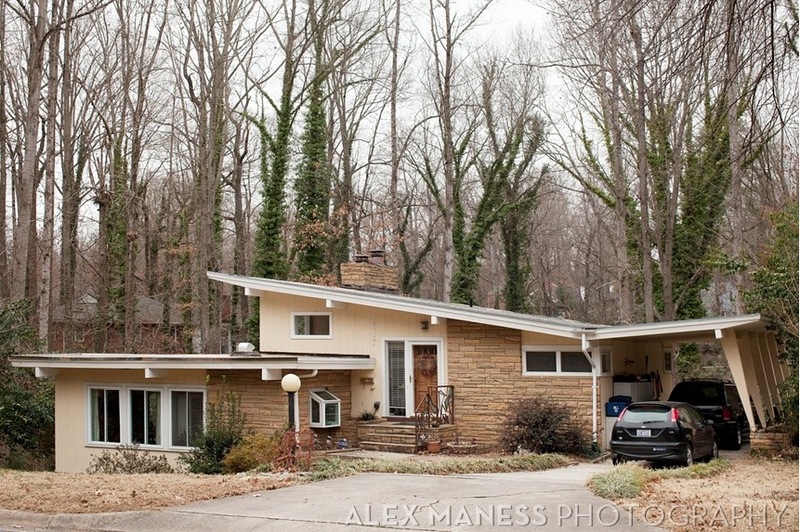 Stewart, the son of Parks Alexander, had grown up in Forest Hills, at 24 Oak Drive. 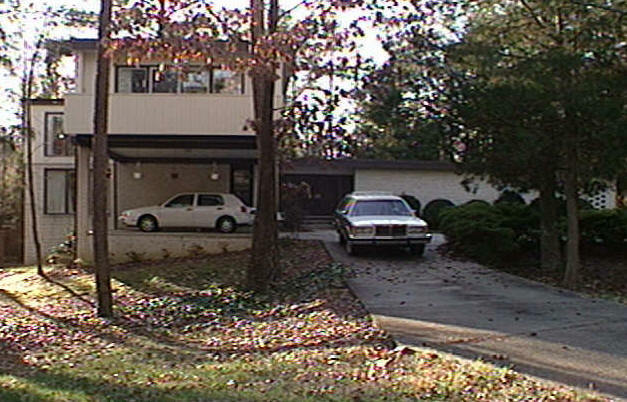 The Alexanders were partners in the Durham-based Alexander Ford car dealership, and the family lived here until 2001. 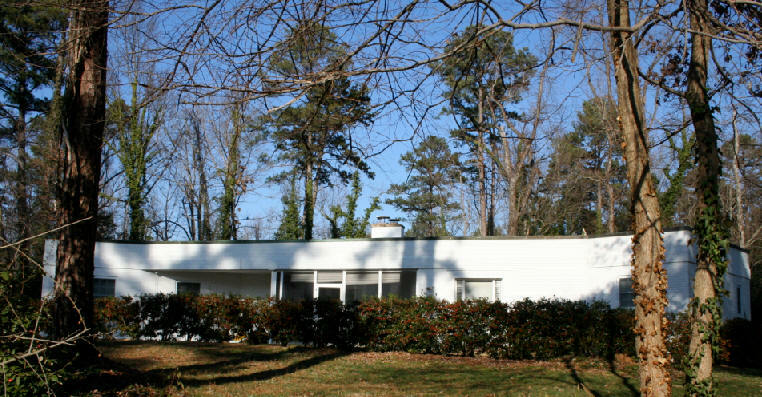 The Cowan Corporation, which was owned by Jane Alexander's family, designed and built the house, which exhibits many characteristics that define the post-war style: a long, low profile with simple geometric shapes and clean lines. 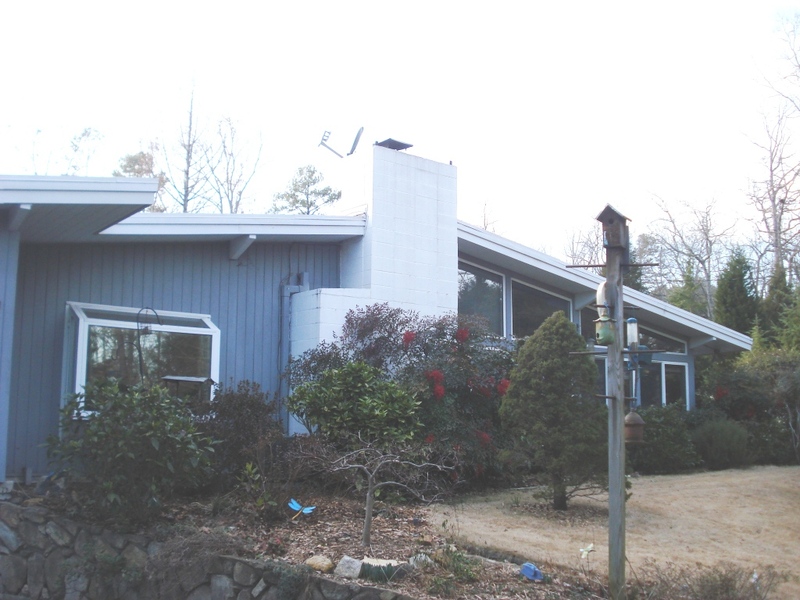 The ground floor is faced with red brick, which contrasts with the gray siding on the smaller second floor (original exterior siding color was Aqua - typical of 1950’s modern design tastes). 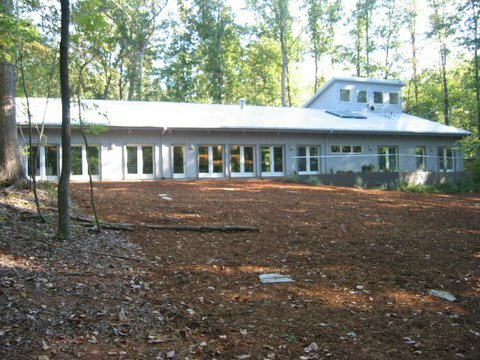 The roof of the ground floor sharply divides the two stories, extending the horizontal line to the east where it covers a carport designed to hold four vehicles. Narrow rows of windows, a flat roof and the long, low profile of the chimney further accentuate the sharp horizontal lines. 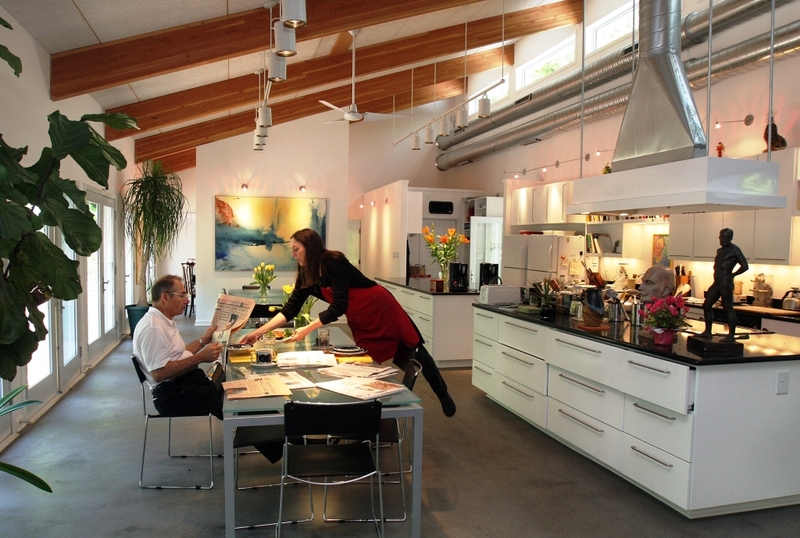 The interior of the main floor was designed as one large open space, with a variety of materials and various floor levels defining the entrance, living room and dining room. 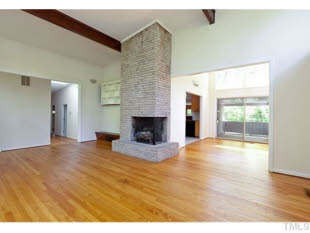 The entire lower level was originally painted aqua, featuring white carpet and aqua & white checkered linoleum floors surrounding the fireplace. 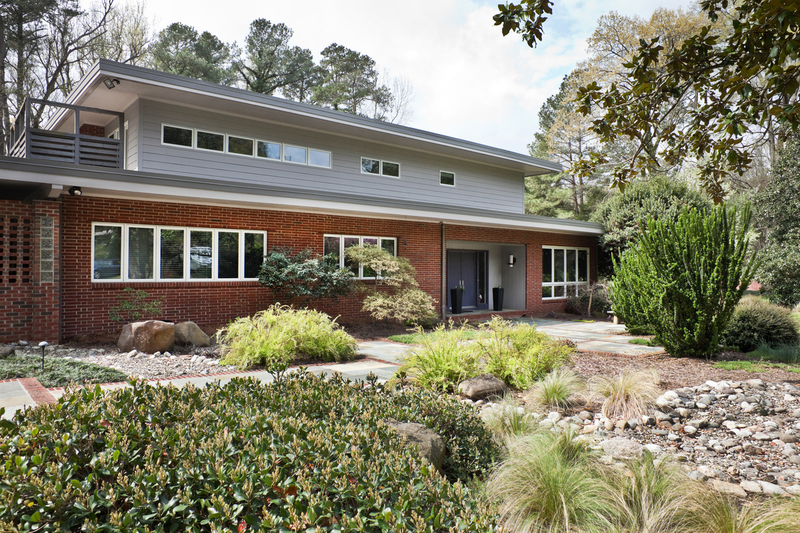 The current homeowners worked with Chapel Hill Architect Giles Blunden in updating and integrating new materials, colors and textures into the original design. Just inside the front door, the original floating staircase of natural wood divides the more formal areas of the house from family areas. 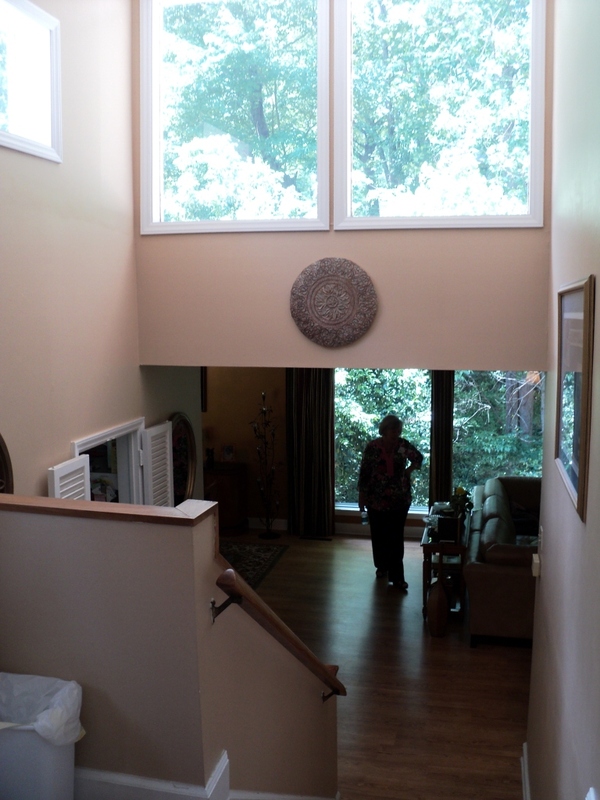 The current homeowners were required by modern safety codes to replace a too-low planter at the edge of the original stair landing. 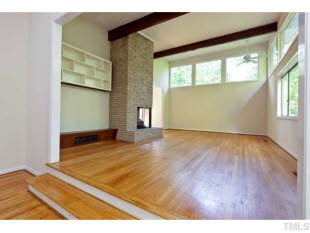 To keep the space as open as possible, they installed a short length of wall integrating the large double-sided fireplace between the living room and the family room at the west side of the house, and added a transparent wall enhancing privacy from the front door. 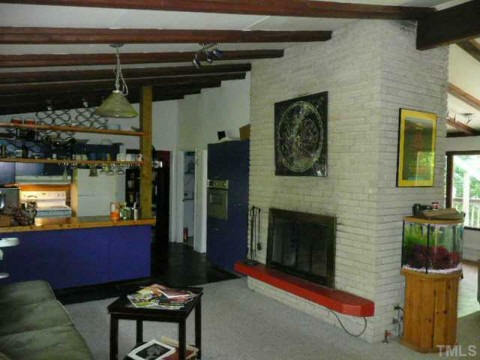 Molded dark gray concrete tiles (by Chapel Hill Sculptor Andy Fleishman) now cover the original white brick fireplace and concrete terrace. The large plate glass windows on the west side of the house are similar to those used in commercial construction in the 1950s, when the Alexanders also built a new automobile showroom. Upstairs are four bedrooms. 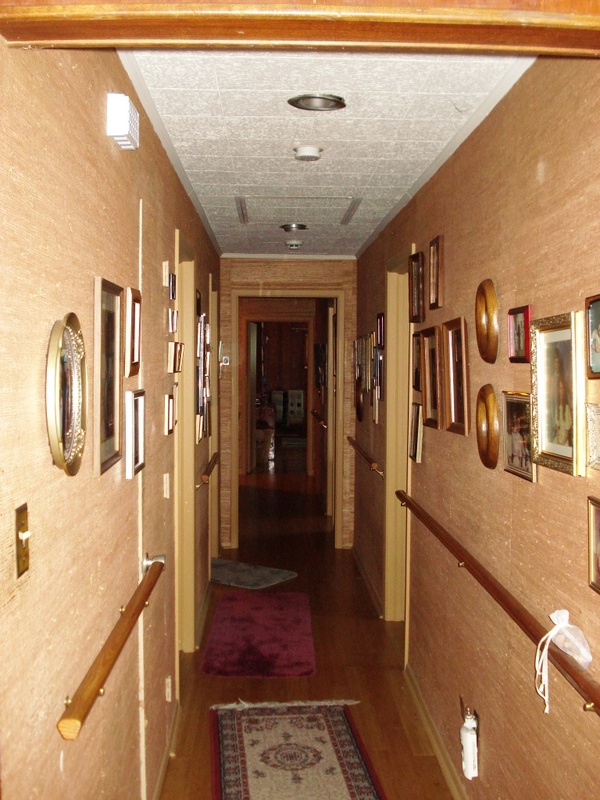 The original dark paneled narrow hallway was widened to create an alcove entrance to the two central bedrooms and skylights were added above stairs for natural light. The current homeowners also expanded the master suite by removing a wall to include a secondary bedroom as a sitting/hobby area. The large master bathroom was remodeled with new steel sinks, glass and wood designed by the homeowner. Off the master bedroom a small deck and French doors were added that lead from the bedroom onto the flat roof terrace extending over the carport. As the upstairs bathrooms were updated, the homeowners decided to recycle original 1950s Robin’s Egg blue fixtures from the master bath and installed them in a new powder room on the first floor, once again integrating the old with the new in this house. The gardens around the house have been extensively re-landscaped by the current homeowners to open up the house to its surroundings. They removed holly trees that had almost completely hidden the house from the street. The huge magnolia tree in the front yard was limbed up to create space for a mixture of plantings and walkways. French doors from the family room lead out to a paved terrace defined by brick planters. Sculptures by Virginia artist Jack Chaffee create an oasis between the house and the woods that separate it from busy S. Roxboro Street. One final note of historic interest: the 1950’s wood and canvas double-sided lamp on the round, metal table in the downstairs living area was owned by the original homeowners and was a gift to the current owners from a neighbor. Sold to John B. and Rose Page Wilson in 1971. Sold to Roy A. and Anne B. Griffiths in 1996. The Earles were the in-laws of Jon Condoret. Designed by Balford Hackney, who worked for Archie Davis. As of 2011, owned by Robert D. and Merry Rabb. 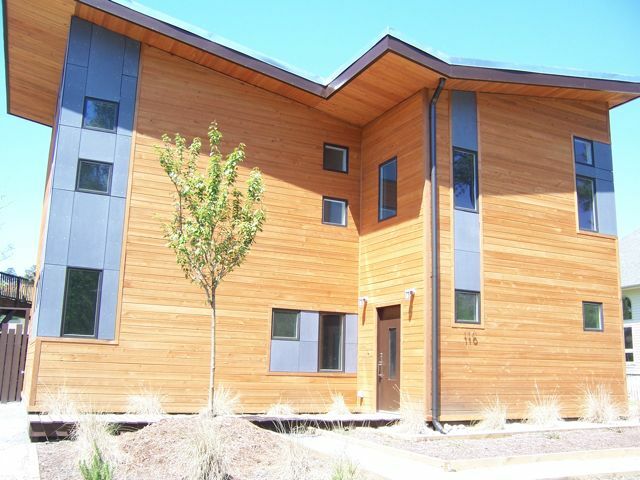 2931 square feet. 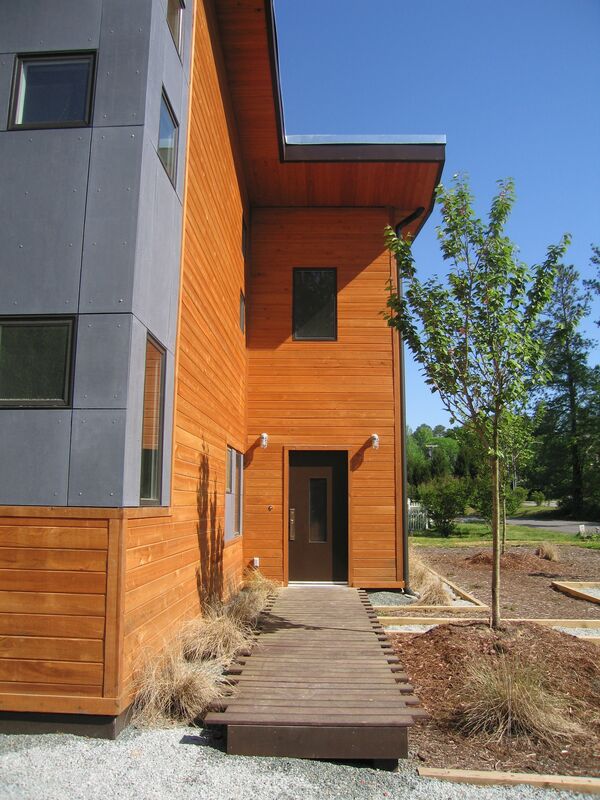 Rudin designed the house for passive solar and chose the lot for its southwest exposure. Framing by Robert Dykes. HVAC by Frank Dadderio. Sold in 1998 to Niall Hanley. Has a low voltage wiring system. For sale in 2011. Designed by the original owner. Built by a man named Wallace, according to owner Walter Obrist. Sold many times. Addition in 1966. For sale in 2011. The house has been in the family since construction. 1772 sf. For sale in 2011. Sold to the City of Durham in 1984. 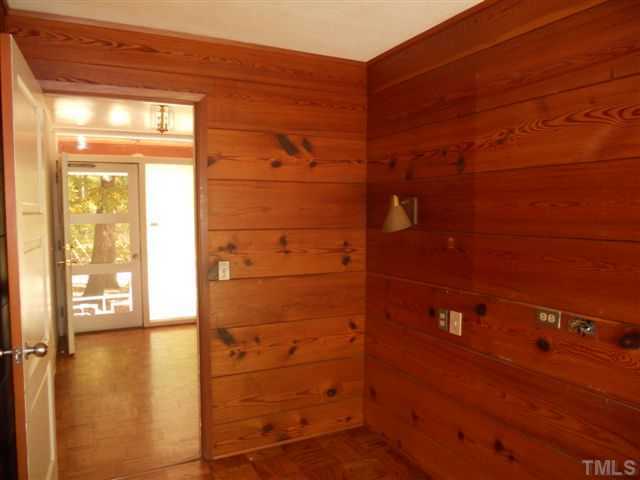 Sold in 1985 to Lester and Therese Fahrner. Sold in 1985 to David M. and Gracie Welsh. 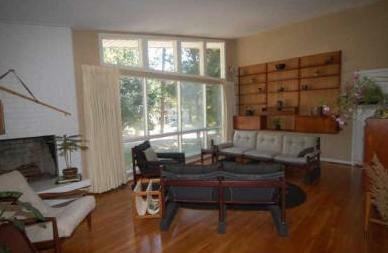 Sold in 1991 to Larry H. and Nancy M. Rocamora. Sold by Atlas Realty and Insurance (Hubert and Dillard Teer) on 12.01.66 to Central Engineering and Contracting Corporation. Magazine plan chosen by Helen, may have been Better Homes and Gardens. Sold to Keith and Jill Kaye in 2000. Sold to Sally and David Vasbinder in July 2006. Renovations by Lee Tripi in late 2000s. Magazine plan chosen by Helen, may have been Better Homes and Gardens. Sold to Keith and Jill Kaye in 2000. Sold to Sally and David Vasbinder in July 2006. Renovations by Lee Tripi in 2010. 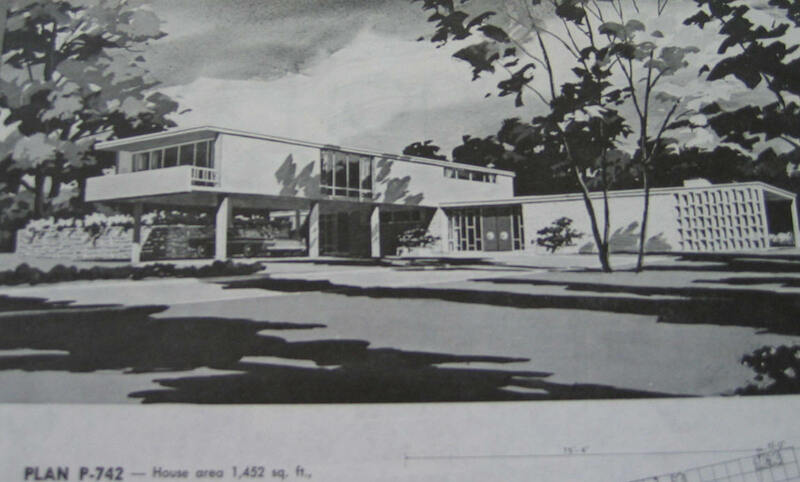 This is Plan P-907 from the plan book Encyclopedia of Home Designs 1967 by Master Plan Service, Inc. 3000 square feet. 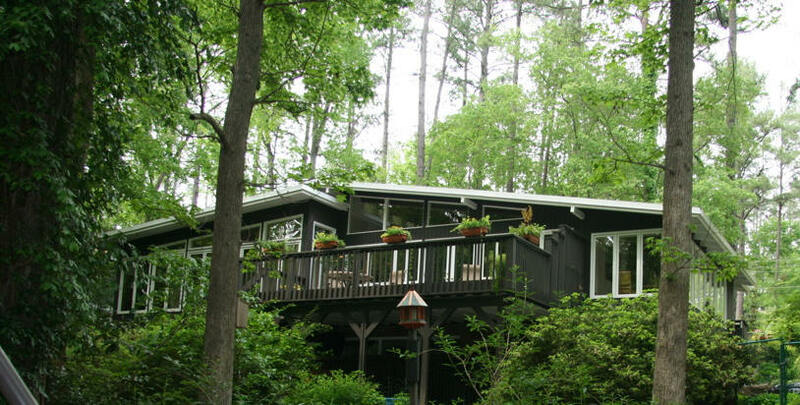 Sold in 2007 to Scott and Julie Hollenbeck. Sold in 2010 to Jina Park and Alan Russell. 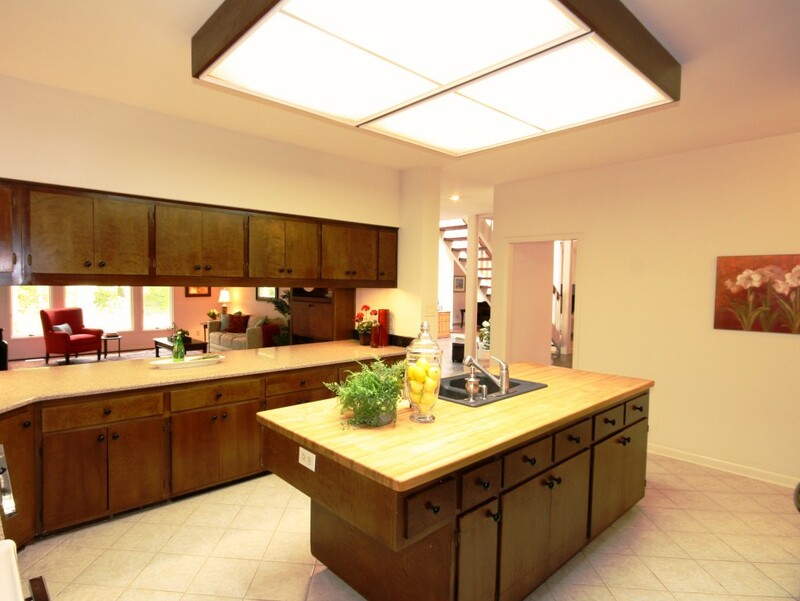 This is Plan P-742 from the plan book Encyclopedia of Home Designs 1967 by Master Plan Service, Inc. 4000 square feet. Sold in 2005 to Barbara R. Haight. 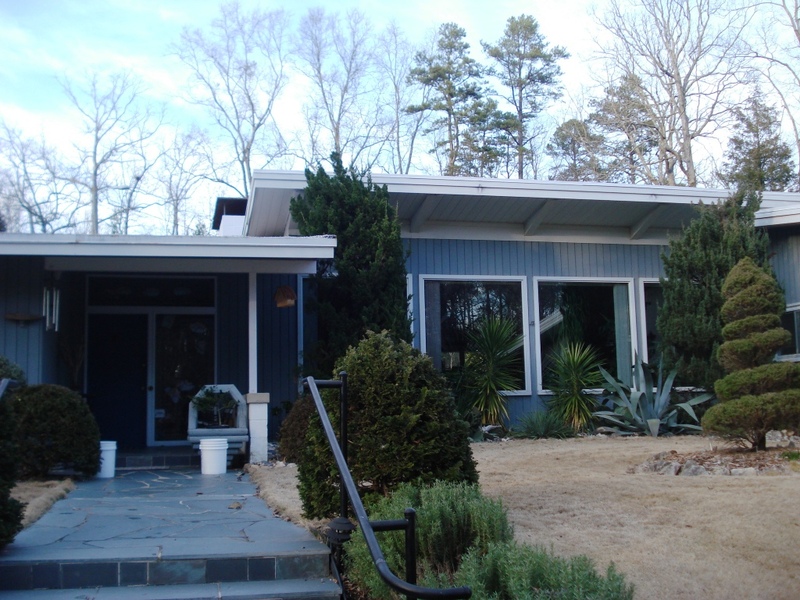 The Kimbles designed this house for themselves, the second they had designed in the area, upon returning to North Carolina from Colorado. They lived here until they both passed away in 2006. Their son Jeffrey Kimble and his wife lived in the house until 2011, when it was sold to Lori McLean and Brian D Chisolm. Olsen built it as a spec house, although he did live there a short time. 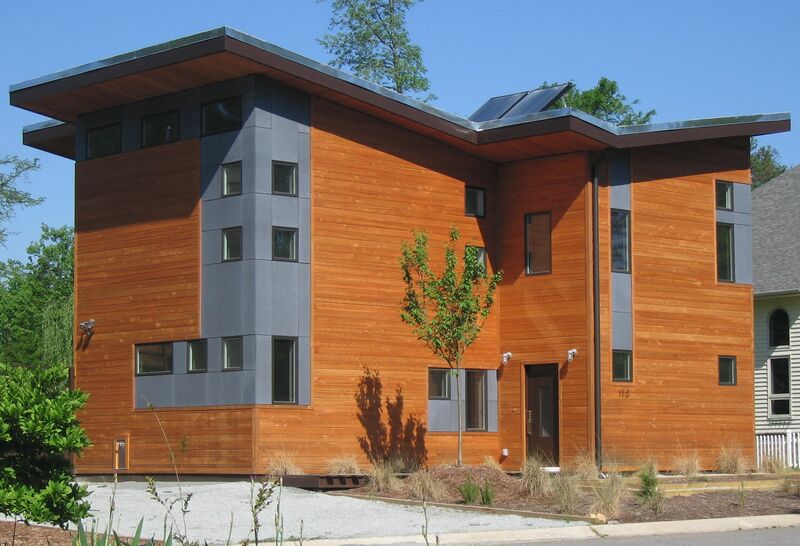 Design/build by Bill Christopher and Matt Hosmer or ILM Design and Build of Wilmington. Sold May 2009 to current owners Derek Cornish and Sally White. Photos by ILM. Designed by Christie with plans drawn by architect and builder John Hartley. She wrote a book about it, Green House, and as of 2009 was working on a sequel.